Now in its 13th year, Chopperfest is a tribute to legendary artist David Mann, and a celebration of the art and culture of the motorcycle. In 1997, David and Jacquie Mann were married at the Ventura Fairgrounds during a motorcycle swap meet produced by local businessman and motorcycle enthusiast David "Huggy Bear" Hansen. Owner of The Shop, an antique Indian and Harley-Davidson motorcycle shop, Hansen has been in business 45 years and produces Chopperfest, while his son, Tory DuVarney, owner of Beautiful Disaster & Handsome Devil Clothing Boutique, says it’s an honor and privilege to be its coordinator. Chopperfest is Dec. 11 at the Ventura Fairgrounds, where Mann married his sweetheart 19 years ago. Mann passed away in 2004 at 64, but he left a legacy of artwork that led him to be known as the Norman Rockwell of motorcycle art. A custom car enthusiast from Kansas City, Missouri, Mann visited Southern California, which is where chopped motorcycles became his calling. “Drawn to the freedom and ‘hell on wheels’ aesthetic of biker culture, David went back to Kansas City in 1959, built his first Harley, and created his first painting 'Hollywood Run,’ a biker-inspired watercolor featuring the Hollywood sign and spotlights in the background,” said DuVarney. Fame arrived after Mann brought “Hollywood Run” to the attention of “Rat Fink” artist Ed “Big Daddy” Roth. Mann, who has also been called “the biker world’s artist-in-residence,” eventually became Agoura-based Easyriders magazine center-spread artist from the 1970s through 2003. 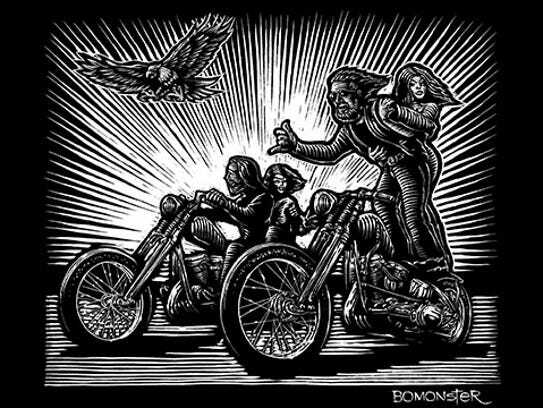 Easyriders magazine gave Chopperfest permission to use one of Mann’s works from 1977, “Show Off,” as this year’s featured illustration. According to DuVarney, “Show Off” is an autobiographical representation of motorcycle culture, celebrating bikes, women and thrill-seeking. New this year to Chopperfest will be special guest Tracy Mann, David Mann’s daughter, who will share her family’s stories with the crowd. One of the event highlights is "If You Build It They Will Come," an all-brand motorcycle show featuring 18 motorcycle classes such as “Antiques,” “Old School Chopper,” “Radical Design” and “Special Construction,” with a Best of Show prize of $2,500. Also featured is the Chopperfest Art & Culture Show with more than 50 artists working in mediums such as acrylics, watercolors, airbrushing and metal, with some live demonstrations. There will also be a motorcycle helmet art show with work by ten artists. In the “World Class Bike Builder Displays,” top industry motorcycle builders, some of whom have been featured on the Discovery, Speed and History channels, will sign autographs, pose for photos with attendees, and display their custom bikes. For Chopperfest attendees seeking motorcycle parts for their rides, there will be a new and used parts swap meet. Another well-received feature of the event is the hundreds of culture vendors selling leather goods, motorcycle accessories, clothing, jewelry and more. Live music for Chopperfest will be provided by the Shari Pourto Blues Band, Lynyrd Skynyrd-style southern-rock band One More From The Road, and rockabilly band Hard Six. Dec. 11, 8 a.m.-4 p.m. COST: General admission $15; Military with ID $10; kids 12 and younger free.